These are so chewy and yummy....and even better, they're really easy to make. If you like coconut and/or enjoy Mounds candy bars, you've got to try these! 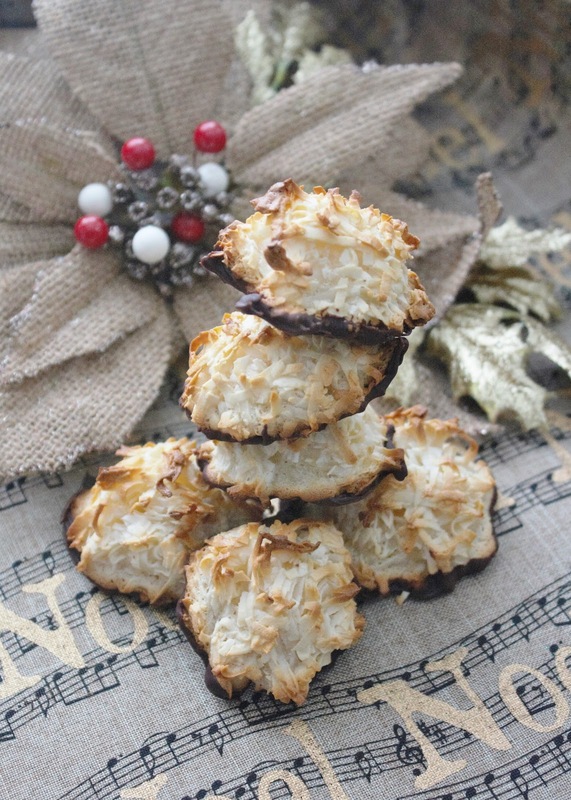 You can make these as a simple coconut macaroon, or dip the bottoms in chocolate as I did. In a medium bowl, mix together the shredded coconut, milk and vanilla. Set aside. Using two spoons, form heaping tablespoons of the mixture into mounds on the prepared baking sheet, spacing about 1 inch apart. Bake for 25 minutes, until the tops are lightly golden and the bottoms and edges are deeply golden. If dipping the macaroons in chocolate, melt the chocolate in a microwave safe bowl at medium power, stopping and stirring at 30 second intervals until just smooth and creamy. Dip the bottoms, letting any excess drip back into the bowl. 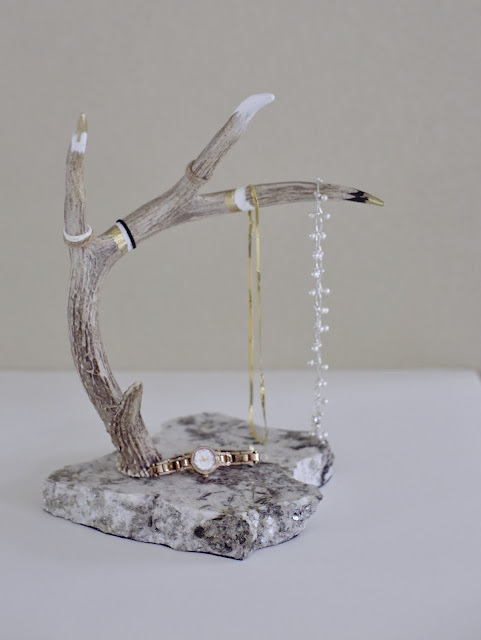 Place on their side on a wire rack covered in waxed paper. Place the racks in the refrigerator for about 10 minutes to allow the chocolate to set. This cookie is making its debut this Christmas season. So far the reviews (my husband and me) are very positive! 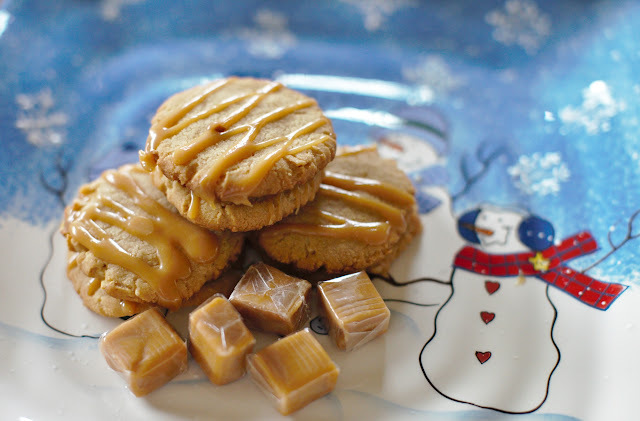 It has a rich nutty flavor and the caramel drizzle is the perfect topper. The recipe is compliments of Martha Stewart....hope you enjoy! Preheat oven to 350 degrees. Sift flour and salt together. Coarsely chop 1 cup cashews and set aside. Process remaining 1 ½ cups cashews in a food processor or blender until finely chopped. Pour in oil. Process until creamy; approximately 2 minutes. Place cashew mixture, salt and sugars in the bowl of an electric mixer with the paddle attachment; mix on medium speed until fluffy; approximately 2 minutes. Mix in egg and vanilla. Reduce speed to low and gradually add flour mixture. Mix in reserved chopped cashews. 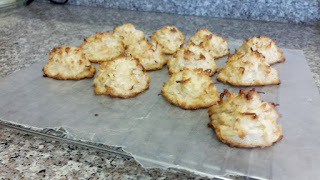 Shape dough into 1 ½ inch balls; space 2 inches apart on a parchment lined baking sheet. Bake 6 minutes; remove from oven and gently flatten with a spatula. Bake until bottoms are just golden; approximately 6-7 minutes more. Let cool completely on wire racks. 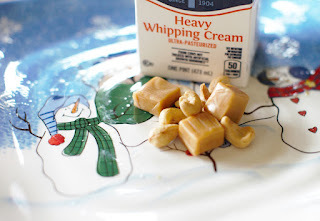 Melt caramels with cream in a small saucepan over low heat, stirring consistently. Let cool slightly. Drizzle over cooled cookies. Makes about 3 dozen.